Alex Oxlade-Chamberlain says Arsenal have taken responsibility for their terrible run of form as they look to claw their back into the race for the top four. The Gunners won away from home in the league for the first time since January 14 at Middlesbrough on Monday evening to move within seven points of where they want to be with seven games remaining. 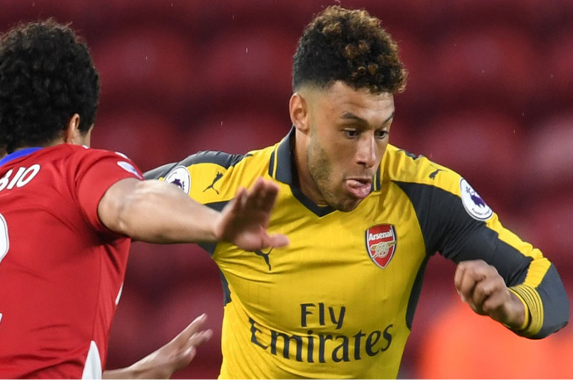 Their focus immediately switched to Sunday's FA Cup semi-final showdown with Manchester City at Wembley, and Oxlade-Chamberlain is hoping for more of the same after something of a reshuffle ahead of the battling 2-1 win at the Riverside Stadium. He told the club's official website: "What we've done previously in the last few games hasn't been good enough. We needed to take responsibility for that and we've done that this week between ourselves. "We knew it didn't matter how we won, we needed to go out there and get back to the basics, and that's making sure that our commitment levels were right to play for this football club. "It's a massive honour to play for a team like Arsenal. You've got to give it 100 per cent week in, week out, and maybe that had been slipping in the last few weeks. "That was the first thing we needed to get back to and we did that. The three points were massive." Goals from Alexis Sanchez and Mesut Ozil either side of Alvaro Negredo's equaliser secured the points on Teesside, but under-pressure Arsenal boss Arsene Wenger took a calculated risk ahead of kick-off. Fearing that opposite number Steve Agnew might throw the muscular Rudy Gestede in alongside Negredo in a two-pronged attack, he employed a three-man rearguard for the first time in his 20-year reign. It was something new with which his players had to contend, but ultimately, it paid dividends. Oxlade-Chamberlain said: "It was something new for us. We worked on it this week. It was a change and new for a lot of us, but I think we've adapted really well to it. "Especially in the first half, I thought it worked really well for us. In the second half, Middlesbrough came out and made it a lot more difficult. They went direct at the end, but all in all, it was a new system and we've got the three points with it - that's all that matters." The victory came as a relief to the 2,995 travelling fans among a crowd of 31,298 with the club's only successes on the road since their 4-0 league win at Swansea coming at Southampton and non-league Sutton in the FA Cup. Oxlade-Chamberlain added: "Look, it's a massive club and that's one thing that as players it's an honour to play for. "To see them come all the way up here and support us after a tough time means everything and we need to keep fighting for them."